On my walk to the subway this morning, I received this message. It was being thrown out with the Christmas trees on Amsterdam Ave. I had been wondering What are my 3 inspiring words for 2011? Here they were: Become. Your. Dream. I decided to visit a church. The image on the sign seemed to be a helicopter. Move. Go. Do the thing you say you will do. For me that means Visit a church a day. I tried to go to St. Paul’s Chapel at Columbia University, but it was locked. Columbia U. must still be off for the New Year’s holiday. I wish church doors were never locked. The gates nearby were locked too. So I wandered out of Columbia towards Morningside Drive. Morningside is such a great name for a street. Here it was morning and I was on Morningside. I remembered the ephiphany I had on Morningside last time I walked there — gratitude. My heart was full of gratitude for every single person I knew. Yesterday was Epiphany Sunday. I thought of James Joyce’s epiphany in The Artist as a Young Man. I think it happened as Stephen Dedalus watched a flock of birds in the sky. I thought James Joyce is gone, but I am alive. Yes, that was my epiphany. I am alive. I looked up at the sky in honor of James Joyce. Because he could no longer look up. And I saw a hawk or eagle circling. It was my ephiphany. I took it in, the literalness and then the symbolism of it – to dream, to helicopter, to fly. I am alive. I remembered another message from yesterday’s Epiphany Sunday at Rutgers Church — love is hard. Although I’ve said I will try to visit a new church everyday, maybe any old church is just as good. I had to get to work. Since the Montreal Notre Dame Church, I’ve started to feel an affinity for any Mary or Notre Dame church. I love Mary. Maybe because my name is Mary or the idea of Mary reveals a softer side of God or religion. The church doors facing Morningside were wide open. 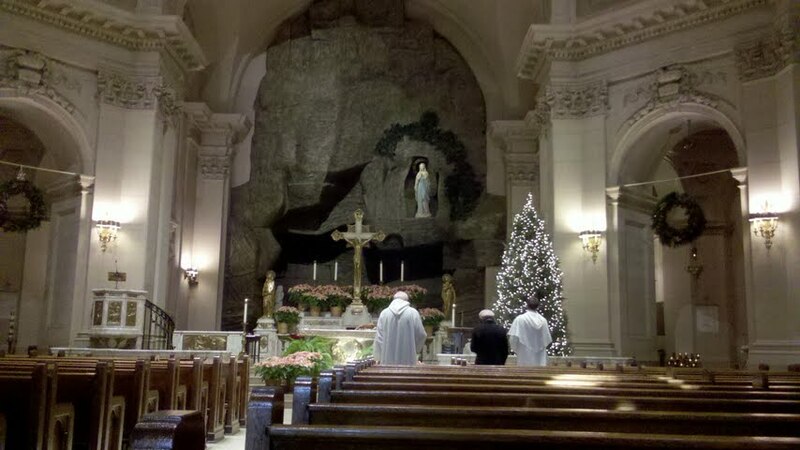 Two priests and a woman in a coat were saying prayers towards the altar. I marveled at how bright the church was. I love bright. But who pays the electric bill? (My mind leaps from epiphanal to logistical in a moment!) I sat in the last row. I remembered a dream I had last night about a woman holding a bird and a snake, laughing while her picture was being taken. I could not understand a word the three at the front said. It was all a mumble until after about five minutes when they concluded, audibly saying, “In the name of the Father, Son, and Holy Spirit.” Those were their three words. I remembered to cross myself as I left. The holy water at the Church of Notre Dame is flown in from France. 3 simple words that can mean a lot. I hope the person who threw it was not frustrated to receive such a message in place of some valuable object as a new year gift. Well Mary Beth, I wish you “become your dream” in 2011.